The Unpopulaire is back! We are finishing the season with a Populaire with enough climbing to make it un-Populaire. But fear not, most of this Unpopulaire’s climbing is at the Iron Horse Trail’s gentle railroad grade. Which means the climbing goes on for a while. For pretty much the first half of the ride, in fact. The trail’s gravel surface adds an extra bit of resistance which will keep you warm in the weekend’s forecasted cool conditions. 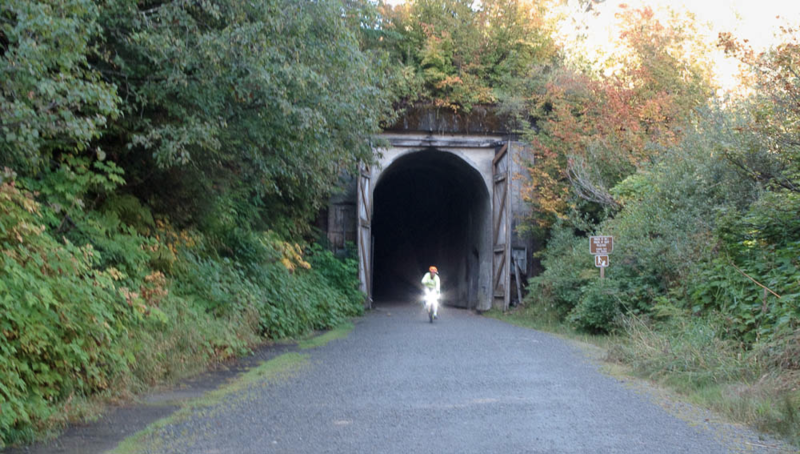 The ride quickly leaves North Bend on the Snoqualmie Valley Trail. After passing under I-90 the trail settles into a steady, relatively steep railroad-grade climb to Rattlesnake Lake State Park. At the park we stay on the gravel trail and make a couple of sharp turns to reach the Iron Horse Trail. There is a short bit of steep climbing on the transition between trails. 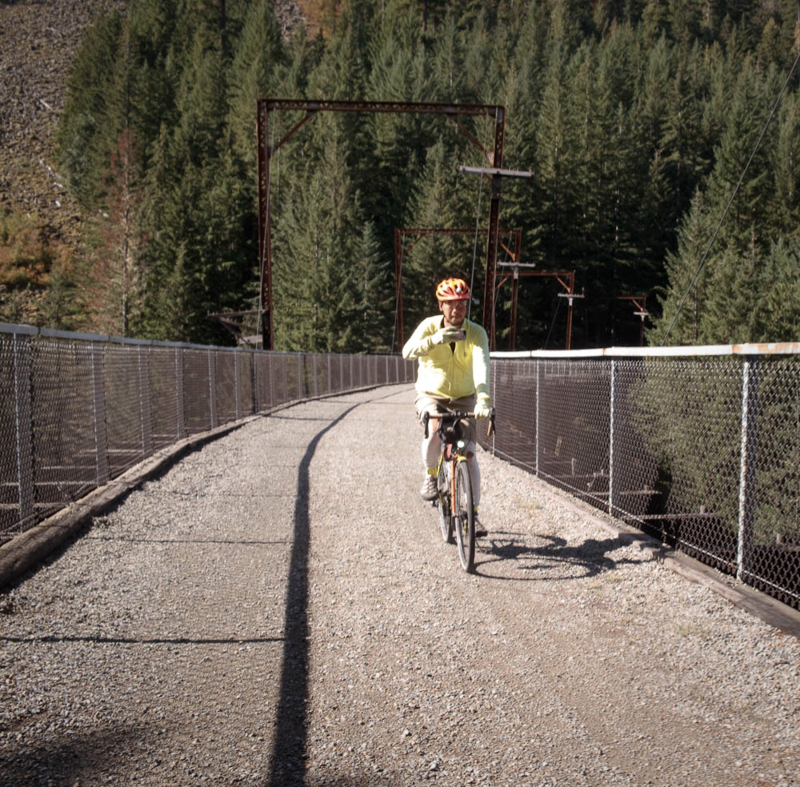 Next, and it is a long next, the route heads up the Iron Horse Trail for almost 19 km to the Snoqualmie Tunnel. When you are crossing the high trestles imagine the experience when the trail was first opened and the trestles did not have railings! The surface of the trail was in excellent condition on the pre-ride, with just a few muddy spots. The conifers seemed happy from the recent rain. Deciduous foliage was displaying fall colors. There are two climbing areas close together where you will probably encounter rock climbers on the trail. Watch for loose dogs. At the tunnel entrance you may want to don a windshell or other warm clothing. It is always chilly inside the tunnel. The tunnel surface was very hard, with a few depressions where drips from the ceiling are eroding holes. Be happy the tunnel was relined a few years ago; previously one had to brave chilly waterfalls in the first 50 yards at each end. Beware of pedestrians and other cyclists in the tunnel. Your MegaBriteUltra headlight may seem to light up the tunnel superbly, but pedestrians are surprisingly low-viz in the tunnel. Something about the tunnel makes it very difficult to judge distances to oncoming lights and reflective striping. Emerging from the tunnel you will find yourself at the Hyak Trailhead. Water and restrooms are available in the building on the left. The water spigot is on the west side of the building (facing the tunnel). The route continues a few miles on the trail past Hyak. There are a couple of gates to ride around. The turn-around point and info control is at an interpretive sign at a scenic spot on Lake Keechelus. Retracing to the parking lot, we exit and make a couple of turns to head toward the ski area. The climbing on this road is rudely steep after the long cruise up the rail trail. IGNORE the Bike Detour sign! That will put you onto I-90. At the route’s summit we stop at the control at the Chevron Summit Deli. This control is untimed since it is at the top of a mountain, so don’t stress if you are short on time or a little behind the closing time. The route passes under I-90 and then turns downhill on Forest Road 58. 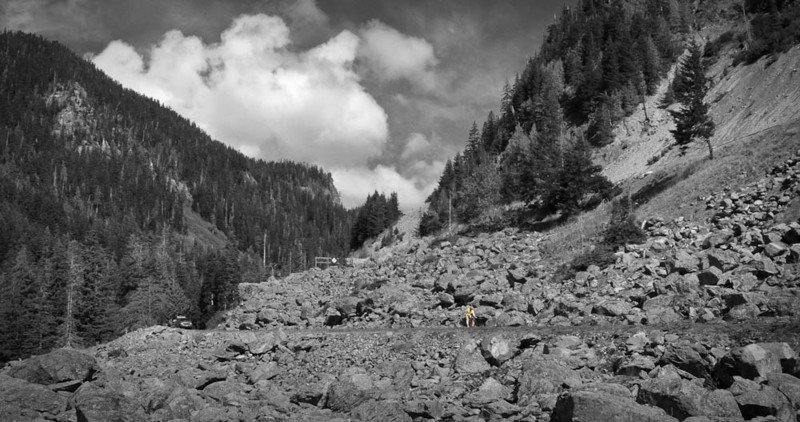 This was the original road to Snoqualmie Pass. 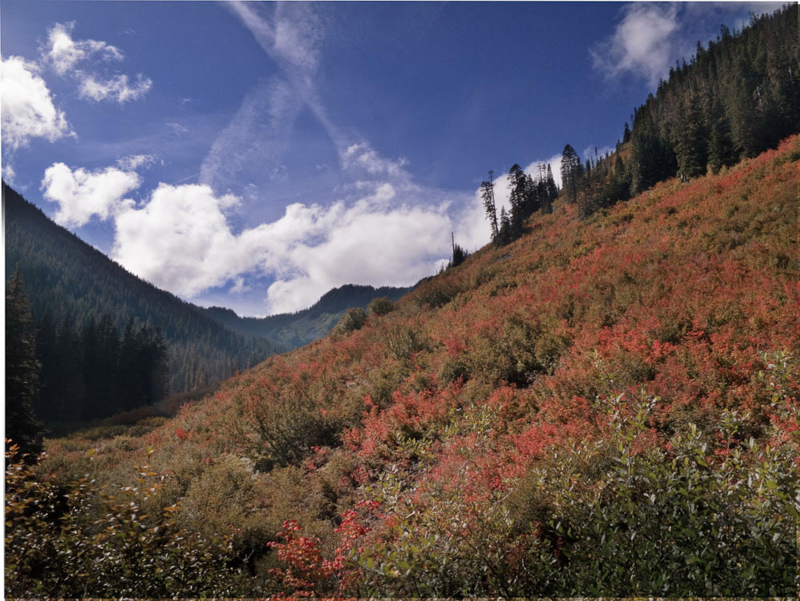 If you miss this unsigned turn you will discover the road ends at the Alpental ski area. Road 58 quickly steepens to a narrow and twisting 9% descent. Enjoy it but be mindful there could be cars driving uphill. Road 58 continues swooping downhill through lovely dense forest. After crossing I-90 (which is suddenly, shockingly, noisy) we glimpse a brief, “secret”, vista down the South Fork Snoqualmie River. It is hard to believe this coexists with the freeway just yards away. The route continues under heavy tree cover on Road 55/Tinkham Rd. Tinkham Rd is a dirt road, with a generally very hard surface but frequent potholes. The potholes cluster in pothole minefields. Stay alert and watch your speed here. Tinkham has two hazards noted on the route sheet: At around 46.4 miles there is a wooden bridge with a gap down the center, in the direction of travel. A bit farther at around 48.4 miles there is a huge drainage grate that runs all the way across the road. It resembles a diagonal cattle guard. The grate was dry when we encountered it. We rode across without a problem. It is a surprising thing to encounter without warning. Be very careful if it is wet. All good things must come to an end: The route uses I-90 for about four miles after the end of Tinkham Rd. An advantage of riding the route in this direction is the freeway segment is downhill and over quickly. The shoulder is wide although it had a lot of debris. We got through without problems. After I-90 we cruise for a couple of miles on paved Homestead Valley Rd. Next is a left for the Iron Horse Trail. This is marked by a sign for Ollalie State Park that you cannot read until you turn. But there are no other nearby candidate left turns, so this turn is not hard to find. After going around a gate an 8% climb to gain the Iron Horse Trail is the final big effort of the ride. 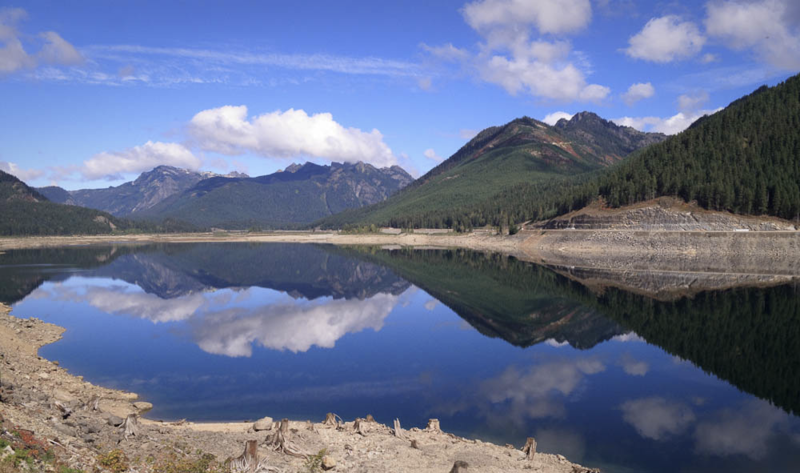 Then you have a serene cruise down to Rattlesnake Lake. The Cedar Falls sign cues you for the unmarked right turn to the Snoqualmie Valley Trail. 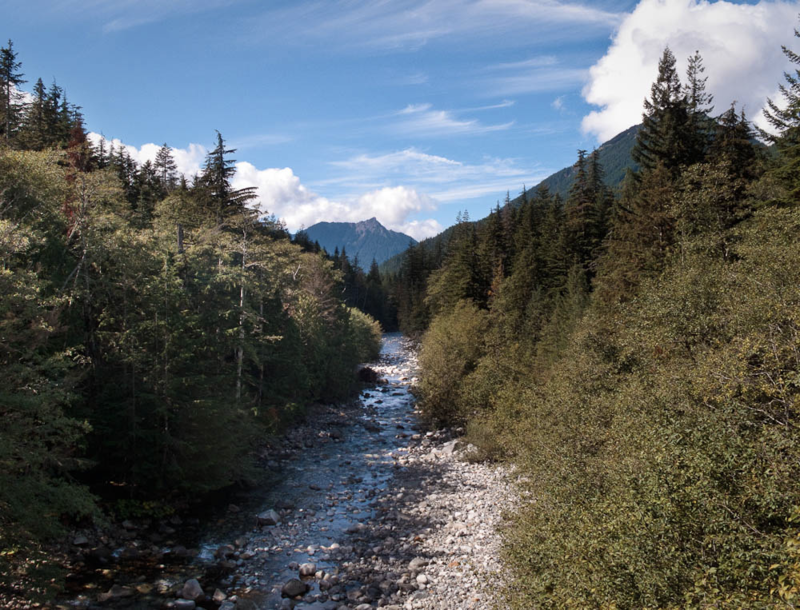 After leaving the state park you will find yourself making good time down the Snoqualmie Valley Trail – if you thought the trail was oddly difficult for a rail trail on the way up, you were right. Back in North Bend, the finish is at Pour House, a few blocks past the start. An SIR volunteer will be there to collect your brevet card. Beware the drips in the tunnel have dissolved minerals the can discolor some metal objects on contact. Specifically, a cranebrass bike bell, and I’m not sur what else.